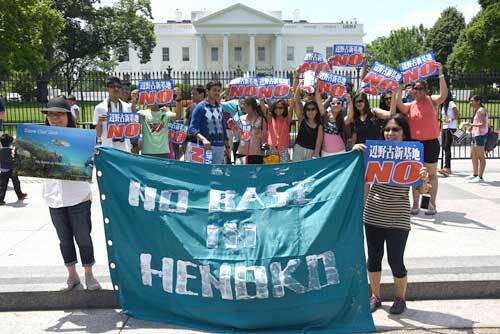 On June 1 in front of the White House in Washington D.C., Noriko Heller (front left), Rachel Clerk (front right), and many other supporters demonstrated their opposition to the Henoko relocation plan. June 3, 2015 Ryukyu Shimpo Ryota Shimabukuro reports from Washington D.C.
On June 1, Okinawans living in the U.S. gathered in front of the White House and showed their objection to new military base construction in Henoko. The demonstration was timed to coincide with Governor Onaga’s visit to Washington D.C, where he requested a review of the Henoko relocation plan. Protestors held a banner, which read “protect the ocean”, attracting the attention of onlookers. Some passersby expressed their sympathy and held the banner with the Okinawans, while others offered future cooperation. The demonstration, named an “Okinawa Peace Appeal in Washington D.C.”, was arranged by Noriko Heller, who is originally from Nakijin and lives in New Jersey, Rachel Clerk who is from New Jersey and assisted Mayor Inamine as an interpreter, and Yoshiharu Higa who is based in New York. From June 1-June 3, they demonstrated every day from 11 am to 3 pm. The organizers also asked citizens’ groups and people who are interested in Okinawan issues to participate in the demonstration. Professor Emeritus at Brown University, Steve Rabson, who is one of the international intellectuals supporting Okinawa’s struggle to oppose the Henoko landfill attended the demonstration. Paul Ceaser, a citizen who was visiting Washington D.C. from Vermont, stopped and listened to Ms. Heller and Ms. Clerk. He said, “The U.S. military occupies many places in the world and destroys the environment. Military funding should be used for welfare instead. A senator from my state will enter the presidential election next year. I would like to appeal to him on this issue.” Then he joined the protestors and held the banner with them.